Deramoto witness as a new being has arrived to the group, very enthusiastic it seemed as well. The person who asked be called Law talked about hearing what was going on, then saying he wouldn't mind helping instead of doing his daily duties, in which Deramoto responded "I think you should possibly do your daily duties instead, you wouldn't want to miss out on them for one day and everything be off centered..."
Deramoto then eventually heard Eve say something about wanting to be a hunter as well and that there can only be one thief, meaning there can be a multitude of others, but how much? And also would they need two hunters? "If Eve wants hunter, I can take something else, just unsure of what though..." he said, still remaining emotionless through everything, but on the inside feeling a whole mix of emotions, he was unsure of what to do still, but his mind was definitely thinking. Eve toyed with her long locks, which had taken to be unruly. Idly curling a strand of hair around her finger, she tilted her head at Deramoto's comment. "You can take Hunter too. I'm sure it's perfectly fine. You should take what you want." She contemplated for a minute. "Besides, two Hunters can be useful. One can engage at close combat while the other backs up from the back." Though she tried, she couldn't keep a slight questioning tone out of her voice. The Guild Master would probably disclose more to them. Lautrec had not noticed his slip up between priest and cleric until the group had brought it up. Of course he knew the difference between them; a cleric is a man who preaches the word of their god while a priest is one who draws upon whatever that god of lights power is to aid a party. It was times like these when he questioned these miscellaneous slip ups he found himself doing. How could he ever confuse a man of battle with a man of peace? Just yesterday when he had found the golden cross necklace tucked away into the deep crevice of his back pocket he questioned what it could be for. He had obviously treasured this symbol enough to pay for it to be cast in gold and strewn on his chest as jewelry and yet the only thing he could affiliate the symbol with was an addition sign. He despised doing the simple mathematics of paying for lodging so there was no way he had put some kind of praise towards arithmetic, and yet whenever he tried to think of what this cross shape symbolized he would come up with absolutely nothing, as if hitting a mental firewall. A wall of fire? He tried his best to put this new idea aside and return his attention to the group he had been so kind as to help. To Lautrec's surprise the group seemed much less enthusiastic than he had hoped. In fact, not only had they shown little care over his sharing of knowledge but they then seemed to turn back in towards themselves showing no mind to the mans character. While this did throw him into slight despondency, something that the green haired girl of the group has said was more than enough to distract him from it. Priest's and Warrior's can't be lived without, huh? He had never pictured himself as much of a caster and while that big armor he had seen those warriors wearing was not quite his style he had already made up his mind. With inspiration (Determination) running through his veins he knew his next step. "Well, it was a pleasure meeting you all here. But I'll just excuse myself now to finish up with those duties. Maybe we'll meet again in a weeks time?" He gave one last smile and a small bow before breaking off from his newly characterized acquaintances and with long strides making his way towards the warriors guild. Anzan shrugged slightly confused as the newcomer dismissed himself from the group calling after him "Sure I guess laters man" he then looked round and seemingly readjusted now they were back to their group "So then guys the priest's guild is only a few streets away so I guess we could head over there for Seishin and work the rest out from there" he smiled looking to Seishin who replied "Thank you, that sounds good" and then, seemingly satisfied with the `living arrangements` which were mentioned by the friendly kebab dealer said "Oh and we can sort out the place we can stay later after we sorted out this guild stuff; not even sure how it actually work when I think about it but, we'll figure it out" he then looked to his group of friends and started heading off in the direction of the Priest's Guild with Seishin in tow. Leaving it down to the others whether they wanted to tag along for Seishin's sake at least. A few streets away; now by the Priest's Guild, Seishin saw Daikan and Ryuko "Hi guys where have you been?" he asked, Ryuko spun round and smiled arms out wide "Seishin! Anzan! Guys! How are you? We've been shopping and then bumped into a guy called Zenki, cool guy anyway he is the leader of a party and saw that we were new, so offered to let us join his party, we kinda accepted and yeah he gave us some maps he sketched with the guilds circled on them hope you guys don't mind" Seishin smiled "That's great for you, we kinda formed our own party too... not sure who's in charge but... I guess we'll figure that part out somehow" Anzan nodded "Wait so what are you guys gonna do?" Ryuko smiled and said "Well I'm gonna become a Warrior because then I can get right in on the action" she grinned gritting her teeth and then continued "And Daikan here is gonna be a Priest" patting him on the back; Daikan smiled back. Anzan laughed "That's awesome guys so, umm could we maybe bother you for one of the maps? Apart from this guild for Seishin, we're kinda unsure of where we gotta be" Ryuko laughed too "Nah it's fine guys no probs, here we've got three he kinda sketches them and sells them to the new recruits, you'd be surprised how much money Zenki makes from it" she handed him one of the maps which he turned and said to Eve "You know you seem kinda the best with this sort of thing do you want the map?" offering it to her. Seishin meanwhile said "Right well.. I guess I should head in and... see how this works?" Anzan nodding as Daikan joined Seishin and said "I'll go with you I guess we're kinda... Priest trainee's together in this" and with that Seishin and Daikan headed off into the guild Seishin saying "I'll see you guys later" and waving before disappearing from view. "I said was unsure of what to pick, and sort of don't want there to be multiple of something unless there nothing else I should pick" Deramoto had responded to Eve. He then noticed the Law leaving and saying that they'll meet up later possibly. Deramoto watched as the two decided to go to the priest's guild, so he decided to tag along with the two, seeing as they were going to somewhere that was obviously known of where, and he didn't want to go wander around looking for a building he didn't know what it looked like. Upon listening to the four and now hearing they have the map to these buildings, he quickly scanned the map to figure out where all the guilds were, and to quickly try to figure out which one he felt suited him. "Alright, Eve, let's go to the hunter's guild" he said, he was unsure of what he wanted, but maybe he can try figuring out why Eve want's to be a hunter on the way there. "Hu-uh?" Eve stuttered in surprise as she was randomly handed a map. Stealing a glance at it, she stared at Anzan in surprise. "What? No, no. I just happened to run across someone who had all this information. It's not like--" But, they were already gone. Of course, she was kinda speaking sotto voce too, but regardless. She had enough time to sigh before Deramoto urged her on to join him in going to the Hunters Guild. In hindsight, she noticed they had no Dread Knights in their party. She did not know how much it impacted them, but having a large party such as theirs, she was sure it wouldn't be of too large a consequence. 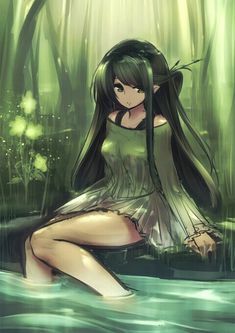 This time taking a good long look at the map, she turned to Deramoto, nodded, and silently began walking to the Hunters Guild, pausing by the rest of the party in case anyone wanted to confirm the location of their respective Guilds. Deramoto started ahead, then paused when he realized that Eve had stopped for a moment, then continued when she did. "So, give me reasons why you would want to be a hunter, I'm sure there is more reason to it then just a wolf companion, if there isn't that's fine with me I guess" he stated, he didn't look at her or change his tone, still hiding everything away but simple comments and questions. He knew that it wouldn't be long until they reached the guild so he hoped to get a good enough answer that will ensure him that he should pick hunter, considering he is leaning away from it since someone else is hunter as well, and he prefers doing things by himself. "...Any other reason?" Eve repeated the question, quietly. "...I-I don't know. I get the feeling I like...or used to like nature. I'd like to learn more about it, and besides, I'd rather not fight outright." At this point, Eve was just grasping for reasons. Did she leave any out? She turned to Deramoto, curious. "What about you?" From what she'd learnt, Hunter was a very versatile class with much potential. It was no surprise someone else was enamored by it. Eve had told him her answer to the question, but then questioned why he wanted to be a hunter, which he really didn't have one, it was more to stay a good distance from everyone and that didn't think any of the other ones would fit him, that was it. "I thought it would be a nice way of standing away from everyone, considering I will have to be near the group in this place anyways..." he said "that's part of the reason why I asked you, so I can get a better idea of it." He knew it was a few more steps until they got there so his attention started to become more towards the surrounding buildings. Once Deramoto's attention diverted, Eve lapsed into silence too. Her fingers brushed her lips, rubbing away the last traces of the delicious meat. She pondered quietly, as she walked; she knew herself to be unsocial, such a personality to be ingrained deep in her sub-conscious. She naturally avoided people like the plague. Society frightened and disgusted her; perhaps it was because she did not understand or accept its flaws. She sighed lightly. And yet, she had entered a somewhat trust-worthy party...she hoped. She found herself in company, walking beside a person - albeit an unsocial one like herself - the heavens had truly fallen. Anzan was walking slightly behind Eve and Deramoto having thanked Ryuko for her help, the map and wished her good luck with the hopes he'd see her and Daikan again at some point. He also knew that he'd find out how it all went down in a guild when he joined one and wondered how Seishin was getting on. Anzan had stayed a little quiet behind them whilst they discussed their reasoning for joining the Hunter's guild. He figured he'd make sure they got to their guild safe before going off and finding the Thief's guild, after all he cared about his party, and didn't want anything happening to them, in this place that no-one seemed to know. He looked around at the buildings in the area and was lost in admiration of the architects who came up with these beautiful buildings. He then stepped up alongside them and said "So you guys seem to have it all figured out huh?" turning and walking backwards alongside them being quite well-balanced and agile with his movements "You know so do I being a thief I can keep general tabs on peeps and make sure we have enough to get by plus I kinda like the idea of how thief's operate" smiling at his two friends and fellow party members. Seishin and Daikan had entered the Priest's Guild and were greeted by a pair of what they assumed to be higher level Priest's, the pair consisting of; an elderly man with short greying hair, a slight hunch and light stubble, alongside a younger woman with brunette hair in a french braid who seemed quite confident and kindly. The lady spoke first saying "You are here to join our guild yes?" Seishin nodding, not sure whether or not to speak, or stay quiet out of respect "Good in that case membership is 8 silvers, this includes clothes, your week's training and accommodation for the duration of" Seishin's eyebrow raised knowing that was the majority of his funds, but if he was to get by in this world he needed to be in a guild, so he calmly reached into his pouch and pulled out 8 silvers handing them to the lady who in turn replied "Very nice you will be my student, is that going to be a problem?" putting her hand on Seishin's shoulder who once more nodded and smiling as she led him off to begin his training. Daikan repeating the procedure with the quiet male instructor and also going off to continue his training separate from Seishin to enable full focus on the task at hand. Deramoto had noticed that Eve decided to go silent, but he hadn't noticed the follower, who asked if the two had everything figured out. He didn't have anything figured out, he somehow is stuck within the flow of time, as if he had little to no option in what to do. He cleared his mind of this useless thought and looked back to Anzan "Wouldn't it be smarter sticking with Seishin? I think it would be smart sticking in groups of two in this world, or at least until we understand it better" he told him. He noticed a building that seemed off from all the other buildings, on the sign quickly read something about a Hunter's guild "We're here it seems"
Eve was startled out of her thoughts by Anzan suddenly catching up and facing them, walking backwards to avoid impeding them. She hadn't realized she'd been biting her lip as her thoughts danced a tantivy rhythm - regardless, she found herself looking at the road, mentally calculating how long it would be before Anzan caught his foot on something and tripped. However, once she concentrated on it, she realized that the roads were not all that crude. They were fairly level, and looked quite well-maintained. "Ah." She stopped when she heard a mew beside her. Bending, she found the source of it - a small, ant-eater sort of thing. Huh? What was an ant-eater? Was this...a cat? Yes, must be. The thing mewed again, this time placing its front paws on her knees. "...M-Mm, you're cute..." She found herself quite besotted by the little fluffy being. Anzan raised an eyebrow confused slightly "Why would I stick with Seishin he's gone into the Priest's guild, I'm not becoming a priest and waiting for him? Who knows how long he'll be?" He shrugged smiling to take the edge off of things wondering if Deramoto didn't like him. He then spun round to face forwards and walk properly with them "So, I figured I'd tag along with you guys here then head on over to the Thieves Guild that's supposed to be only a little way away from here" upon reaching the Hunter's Guild he said "Nice looks like you two have reached your destination" Anzan then gave the pair a thumbs up and smiled confidently "Trust me I know you'll do great as Hunters" he remarked knowing Deramoto had seemed unsure of the Hunter role. He then pivoted on the spot looking to Eve as she fawned over the small cat-like creature "Aww ya know it actually is kinda cute when you look at it; takes the edge off the stress of this place just looking at it" he added. Anzan then looked to his fellow party members "Well seen as you guys are here I'll be taking my leave to go to the Thieves Guild and we can meet up again..." he paused unsure of where they should actually regroup after their training. "True, but you never know what could happen, did you at least tell him where we will all be meeting? And where is it we are all going to meet?" he said "I was planning on heading back afterwards." He thought of how Anzan needs to think more of the possible outcomes, and he figured of telling him that, but he decided to wait until after all their training to decided. "Let's meet back in front of the Priest Guild when we are done" he said "Let's get this over with" he walked inside the building. Eve gave the cat a last pat, and trying to ignore it still mewing and somewhat following after her, she waved to it. "Sorry, I have no food." Was she talking to a cat? She must have liked animals in the past life. Past life... Had she accepted this reality as her new life now? Before walking into the Guild, she turned to Anzan. "Why don't we regroup in front of the kebab stall?" Without waiting for a reply, she turned and hurried in to join Deramoto. Deramoto walked outside of the building and stretched, who knew that would be so stressful, but so relaxing at the same time. He quickly looked around before smirking to the empty streets, letting his emotion show with no worries of anyone knowing, he was happy for doing that, but there was some things he wasn't so excited for, like having to worship for a deity, but he's willing to do. His smirk went away and he faced the building, waiting for Eve to walk out, or maybe wait to see if she already left, it wouldn't be that much of a surprise consider she prefers to be alone too, so he waited. A week had passed since Anzan and Seishin had started their training and after the intensity level of it they were both drained physically. Anzan stepped out of the guild clad in his new thief clothing and gear yawning and scratching his head as he hadn't had much sleep; who knew working with a mute would be so tiring, it was primarily watch and repeat with his Teacher, though Anzan guessed it helped with going undetected whilst hunting and things. He stretched a little, with his muscles aching from the heavy workload, that was tailor-made to improve various attributes such as strength, speed, stamina, agility etc. etc. He then remembered that him and his party were supposed to meet apparently by either the Priest's Guild or the Kebab stall and he figured the Kebab stall would be good; with him being hungry from his strict diet he'd been put on for the duration of his training but, he also figured he'd swing by the Priest's Guild and meet up with Seishin first who he felt a sort of friendly close affinity with. Anzan headed over to the Priest's Guild slowly as with his fatigue he couldn't exactly sprint there. When he got nearby he bumped into Ryuko, who was also heading along to the Priest's Guild to meet Daikan; and man was she built now, of a true warrior's build. "Hey there" Anzan said "Oh hey Anzan how ya been?" Ryuko replied jokingly jabbing him in the arm, Anzan rubbing it the jab aching "Yeah, not too bad aching a bit from training how 'bout you?" he asked Ryuko shrugging "Not too bad; at the start of the week my Teacher thought I wouldn't make it being a girl but, needless to say I showed him" bringing her arm across her front, her thumb on her chest and smiling "Awesome" Anzan remarked happy for her to have proved him wrong "So heading over to meet Daikan I presume?" he inquired "Yupp he should be finishing today as I assume you're heading over to meet Seishin" she answered "Of course" he grinned. They then started heading towards the Guild sharing stories and laughing about their training, Ryuko surprised at the fact a Mute could actually be an effective teacher, but he was. Upon reaching the guild they saw Seishin and Daikan who were leaning against the wall dressed in their new Guild provided gear chatting happily, presumably about their training "Hey guys!" Anzan called, the pair looking over to Anzan and Ryuko each smiling "Anzan! Ryuko!" Seishin smiled "So how ya been?" he asked, Anzan replying "Ah not too bad bit achy, you?" Seishin nodding "About the same" Anzan noticed a new-found confidence in him "Wow man you seem like this has done you some serious good" Seishin grinned "Well my Teacher said that to be an effective Priest I can't be too hesitant.. I still have my moments but I'm doing better" Daikan agreeing with Seishin, as the small group all chatted for a short period of time, before a stranger came up likely being from Ryuko and Daikan's party, and told them about a meeting; all saying their goodbye's before going their separate ways, agreeing to have a drink together every now and again at the local tavern. Following Ryuko and Daikan's departure, Anzan and Seishin headed off towards the Kebab stall talking in depth about their respective weeks and potential plans of action for the party, as well as generally getting to know a little bit more about each other. Once they reached the Kebab stall each purchased a Kebab and continued their conversation waiting on their other friends to show up not fully sure on the state they'd be in, but guessing they'd potentially be in a similar way to them. Stretching her aching arms, Eve walked out, nodding to Deramoto who stood waiting. It hadn't been that bad; sure, they'd provided her with a second-hand bow and quiver, filled with about 20-30 arrows, but considering the three knives she wielded, she was armed to the teeth. Deramoto looked like he could use the knives a lot more reliably, but two of them, the small, light ones, were for throwing, and Eve knew she had a better aim. Most the training had been tracking through forests and learning more about the wildlife, practicing target shooting and hand-to-hand combat. They'd slept in a dingy area, with a thin blanket each to cover them; it was bleak and miserable, but the thought that perhaps everyone else was having an equally bad time provided a morsel of comfort. They didn't have intensive physical exercise like the Thieves or Warriors, so they could get by on the meager meals. The two Hunters were lightly armoured with leather paddings, which were more for balance than durability. They couldn't even hold off an arrow, never mind a sword. Slinging her quiver over her back, she turned again to Deramoto, "Shall we head to the kebab stall?" Over the seven days, she felt a sense of kinship for a fellow sufferer, but the training had paid off. Though they'd learnt only the basic skills, and even in those their proficiency levels were extremely low, Eve was already leaning towards ranged combat. The two soon came upon Anzan and Seishin, eating a kebab each, no doubt waiting for the rest of the party. She sidled up silently, wondering if she could startle a Thief, who basically trained in stealth. "One kebab, please." She held out four coppers and dug in immediately; after days of scarce food, the meat was a heaven-send. Deramoto watched as Eve walked out of the building, just as armed as he was with all these weapons. She asked if they should head to the stall and he simply nodded, a Kebab sounded nice right about now, of course he said that they should meet in front of the priest guild, but he decided to just ignore it, as it was probably to late now. Eve walked ahead of him as they walked to the kebab stall, but when got close, she tried to become more quiet by walking a bit quieter to Anzan, then she went over and bought a kebab. Deramoto walked over to the stall and bought himself one as well and started to eat it, watching the three, wondering how their training went.